It is a moment captured in time, a photograph showing the champion racehorse Mendelssohn preparing for the recent Cigar Mile. It could be any racehorse preparing for any race during the many days of regular track-work put in by thoroughbreds. What does the image tell us? Bob Cook, Professor Emeritus of Surgery at the Cummings School of Veterinary Medicine at Tufts University in Massachusetts, offers his view. The headline encapsulates the anxiety of trainer and rider to ensure that a runner does not “run his race” on the day before the race is run. When the runner is the favorite for a valuable race, the anxiety is intense. Unfortunately, the very steps taken to prevent a horse from doing too much in a workout may have unintended consequences. The report’s text describes such a workout, and Eric Kalet’s image illustrates the problem. Mendelssohn, the composer, wrote Songs Without Words and Mendelssohn the horse exhibits Behavioral Signs Without Words. Kalet’s picture prompts me to ask the question: Why not race without bits? Racing’s administrators will protest that a bit is necessary for control and safety. Yet there is ample evidence that a bit causes loss of control. As for safety, a bit can deliver the unkindest cut of all. Bits can kill. Mendelssohn is, in my view, likely to be experiencing intense oral discomfort from bit pressure on the bars of the mouth, tongue and lips. Upper airway obstruction (i.e., “choking,”) is also likely from the raised-head position, lack of poll extension, and retraction of the tip of the tongue causing the bunched-up root of the tongue to elevate the soft palate. The soft palate will already have been rendered unstable and vulnerable to elevation by the open mouth having dissipated what should be a sub-atmospheric pressure in the oral cavity and digestive part of the throat. Equine evolution apparently knew about the principle of “vacuum packaging” long before man used it to lock-down the lids of jam jars. A partial vacuum in the digestive part of the throat immobilizes the soft palate on the root of the tongue. Reducing the size of the digestive part of the throat when running, expands the size of the respiratory part of the throat for breathing. The anatomical name for an air cell in the lung is alveolus; Latin for “small cavity”. Think of each air cell as being a double-skinned, open-necked balloon immersed in a pool of blood. Both “skins” (inner “air” skin and outer “blood” skin) are infinitely thin, gauzy membranes. Under the right conditions, both skins are “porous” to two gases, oxygen and carbon dioxide. The inner lining of the cell is in direct contact with outside air, just like the skin of the face. The difference is that whereas facial skin is impermeable to gas and water, the “air”and “blood” skins of the lung are permeable to both. Under the wrong conditions (i.e., abnormally powerful “suction” pressure during forced intake of air against the resistance of airway obstruction), plasma and red blood cells will diffuse from the capillaries into the air cells. Every air cell in both lungs thus undergoes a form of bruising at each strangled breath. After very few breaths, this can lead to a life-threatening condition called negative pressure pulmonary edema, or NPPE (“waterlogging” of the lung). In the horse, the condition is commonly referred to as exercise-induced pulmonary hemorrhage, or EIPH, i.e., bleeding. The problem in the horse is that even the slightest obstruction to air inflow dangerously lowers airway pressures. The rapid onset of this condition, when severe, is indicated by the all too familiar sudden death of a racehorse. In man, severe NPPE is accompanied by chest pain and a sense of drowning. 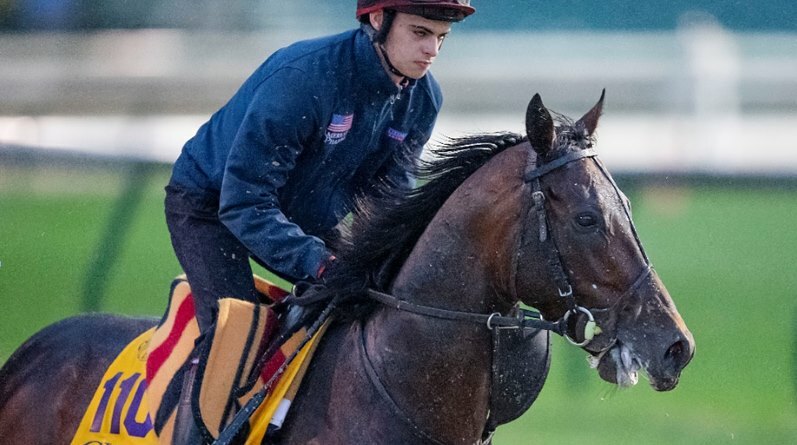 Apart from the circumstances of Mendelssohn’s workout on one particular day, some circumstances affecting all racehorses every day are relevant. Compared with the need for oxygen when grazing, a horse in the wild needs additional oxygen when running. It supplies this increased demand in an elegant and economic fashion by using the increased rate of striding to increase the rate of breathing. It could be said that a running horse breathes with its legs – one stride/one breath – but this is only a part of the story. In fact, the running horse uses the whole of its body to breathe at the gallop; its liver-weighted diaphragm, its legs, spine and, importantly in this context, its head and neck. The unimpeded and pendulum-like swing of the “head bob” (likely to be missing in Mendelssohn’s case) is an energy-saving mechanism that serves both locomotion and respiration. A racehorse in Germany competing without a bit. Dr Cook notes the sealed lips, the lack of drooling and the loose rein. When ridden at the gallop, the weight of the rider increases the demand for oxygen. At first glance it might seem that this additional demand for oxygen could not be met except that evolution does allow for a full-term pregnant mare to gallop. However, demand for oxygen may still exceed supply when a ridden horse is asked to gallop beyond its natural flight distance of about a quarter of a mile. The demand/supply equation may be especially unbalanced if a horse’s head bob is restricted by the bit, jowl angle reduced, lips unsealed and airway obstructed. The pain of the bit is likely to trigger movement of tongue and jaw, which would further stifle airflow at the level of the throat and voice box. Apart from the direct effect of oral pain on the respiratory system, bit-induced factors that could degrade the function of all bodily systems include oral pain, possible chest pain, fear and emotional stress. In a one-furlong canter (200m), a horse will take about 24 breaths. If a horse in Mendelsson’s position cantered even only half a furlong, 12 obstructed breaths could be enough to cause “waterlogging” of the lungs. Whether this happened cannot be determined. The point is that a horse “reined-in” during a workout 24 hours before a race may be at risk of starting the next day with a sore mouth and impaired lungs. A more important point is that most racehorses are reined-in by the bit for some sections of most races. Unsurprisingly, most racehorses bleed from the lungs and some die. As shortage of air leads to muscle weakness and premature fatigue in any athlete, it is likely that suffocation in the racehorse is a factor in the prevalence of tendon strains, falls, fractures and dislocations. It seems reasonable to predict that a bit-free racehorse would have sealed lips; would not experience pain in the mouth or a “tight” chest; would not be thought to require rein pressure to the point of poll flexion to decelerate (a misconception) but would slow down at the touch of a bit-free rein; would not “bleed” in the lungs; and would be at reduced risk of catastrophic breakdown. Other benefits would be improved steering, improved performance and enhancement of the public image of racing. Footnote: Mendelssohn finished fourth in the Cigar Mile on December 1. Cook W.R. (2018b): Seventy reasons for not using a bit. The Horse’s Hoof, July issue, pp 26-29. Cook W.R. (2018c): What does a bit do to a horse and rider?